Three days ago I launched Mica on Product Hunt. 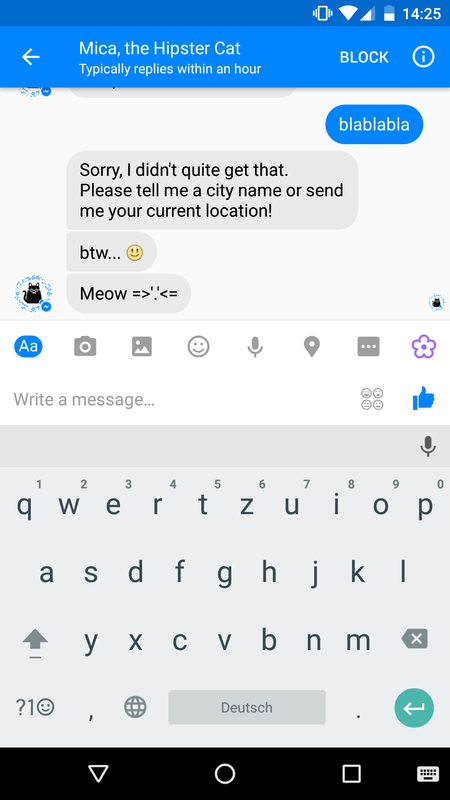 Mica, the Hipster cat is one of the first bots on the brand new Facebook Messenger platform that helps you discover hip venues. You can talk to Mica here 😼. 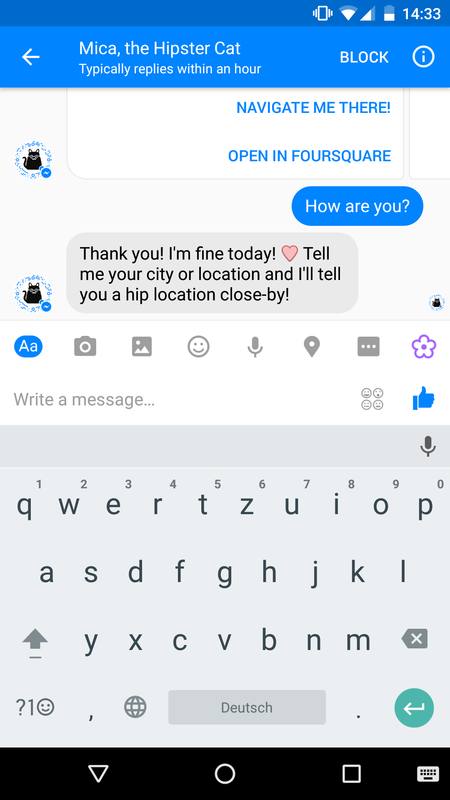 A Chat Bot is a (ro)bot that is programmed to talk to you and answer requests. 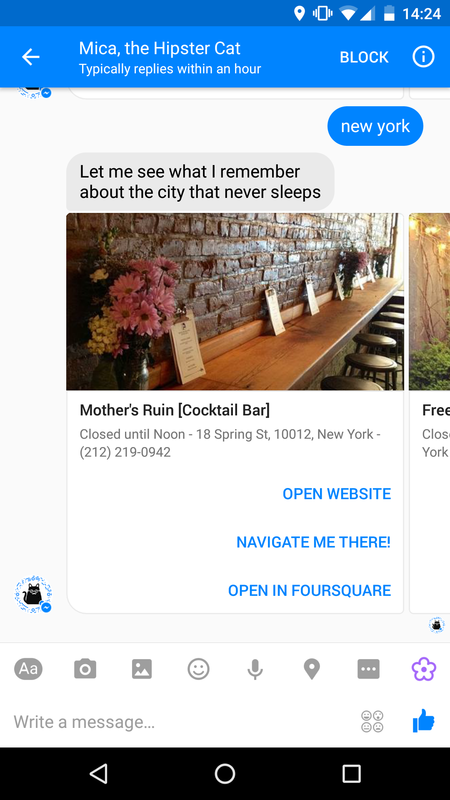 The topic depends on the business’ focus and could be a weather forecast bot, (online-)shop assistant bot, or a hotel reservation bot, but in our case it’s a venue recommendation bot. You don’t need to install a specific app to use a bot because it is integrated in the chat provider infrastructure such as Messenger, WhatsApp or Telegram. I love fancy coffee shops and restaurants! I spend lots of time hanging out in them, meeting friends or working, and I have my own favorite hipster locations where I know the coffee and vibe is just perfect. 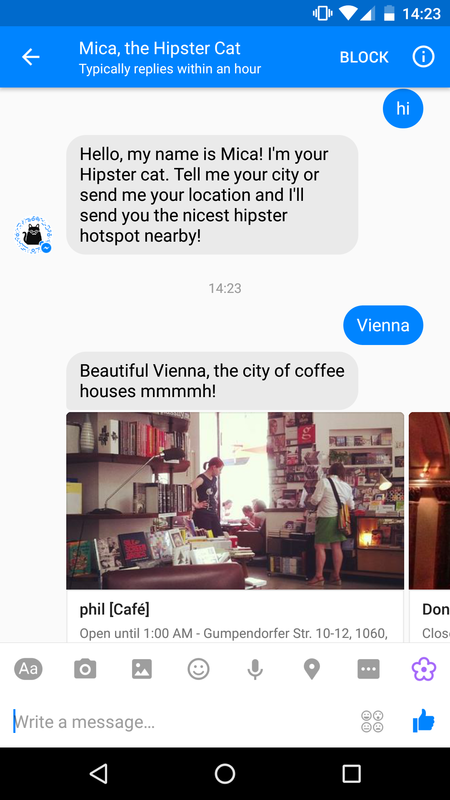 So I thought it would be great fun to have a chat bot that shares my love for good coffee and food that can be asked for recommendations worldwide. This way whenever I want to try a new café or when I travel somewhere, I know, I can ask my trusted companion about her suggestions. 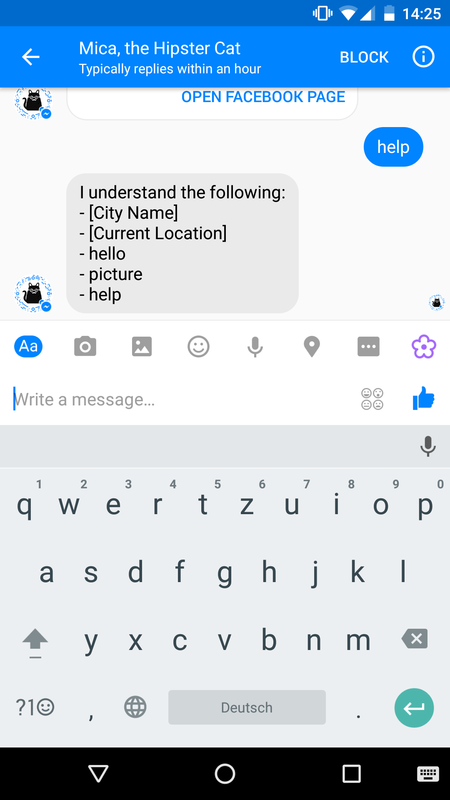 You can send her your location as city name or Facebook Messenger attachment and you can also use some basic chat phrases such as”Hello”, “How are you?” or “Thank you”. So how did the Product Hunt launch go? Quite well actually! Since Mica is a fairly simple bot I did not expect that it would get a lot of attention. But I clearly underestimated the Product Hunt community’s enthusiasm for cats and coffee. What happened in the past three days? 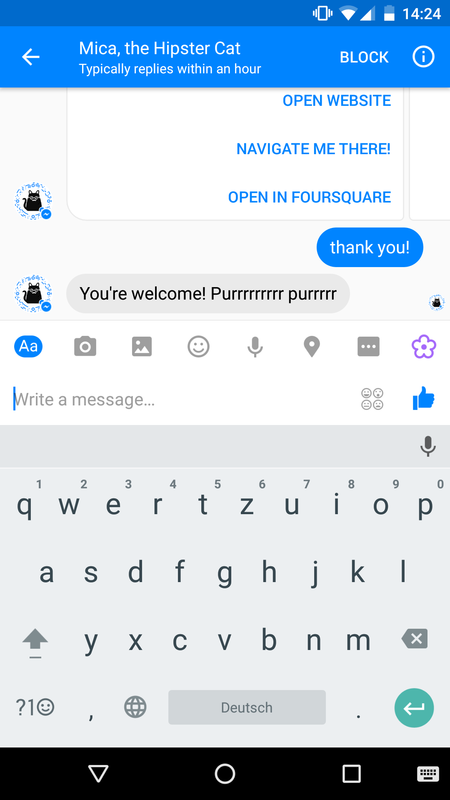 Building a bot for the Facebook Messenger platform was way easier than I expected. It just took me two afternoons to get to a simple proof of concept. 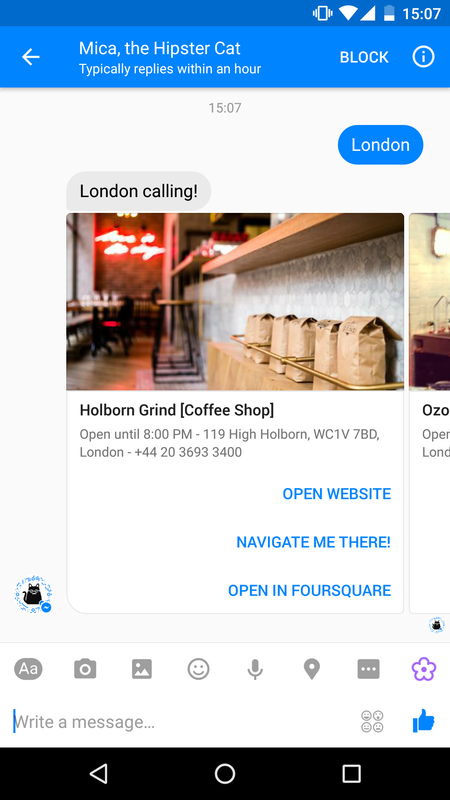 Now that Mica is white-listed 900 million users of Facebook Messenger can get coffee shop and restaurant recommendations without having to go to any app store. They can just directly interact with Mica. 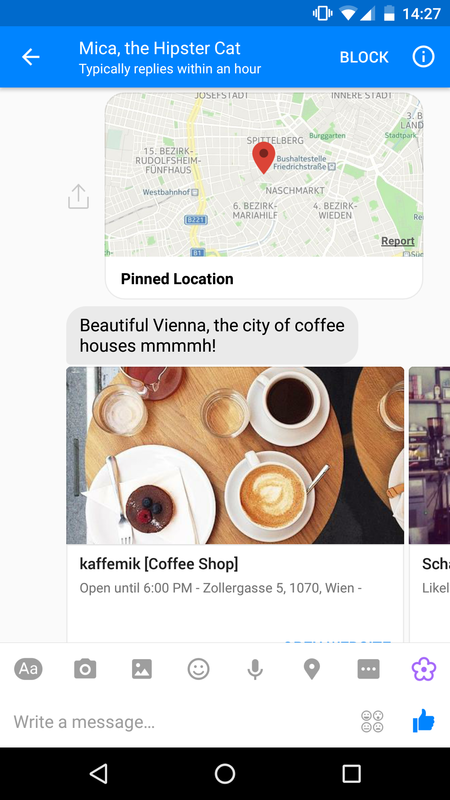 This might not sound like a huge deal but just a few months ago I also built location based recommendation apps for iOS and Android. One big adoption barrier for apps is that you have to get people to the app store to download your app. If your app is not mission critical this is even more difficult. The whole process of downloading apps is quite complicated for many people. It often means they might have to enter a password or figure out how to free up storage by deleting other apps. Because of that some people don’t use any apps apart from what comes pre-installed or what other people helped them to get onto their phone. By building on top of the Messenger platform a lot of adoption barriers suddenly disappear. Another key learning was, that most people don’t understand the concept of a chat bot (yet). Some never heard of it, some think that you have to install a separate app to use it, some are just not interested (yet). 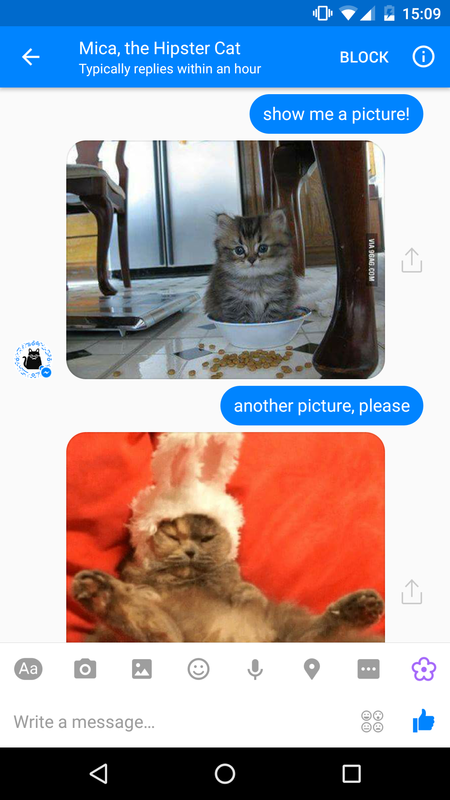 I’m currently working on a Telegram bot to cover its users too — they recently announced to serve 100M monthly active users. These are quite exciting times surfing on the first wave of something new, that might be a game changer for the whole industry like blogs were before in 2004 or apps in 2008.